The Eppendorf Mastercycler Ep Gradient Thermal Cyclers are known for their fast heating and cooling, with speedy gradient PCR cycling for the best in optimized reaction conditions. 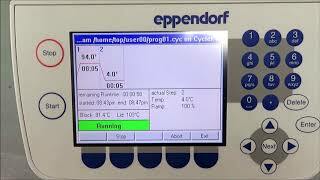 This PCR system uses a control panel to manage reactions, and can be operated through the key pad or with use of a mouse to easily edit and store up to 700 protocols. These thermal cyclers can also be daisy chained, up to 30 units and controlled through a PC should you need a higher throughput. The Eppendorf Mastercycler Ep Gradient Thermal Cycler features heated lid that avoids preheating samples and minimizes unspecific annealing. This gradient thermal cycler also utilizes SteadySlope technology for consistency in heating and cooling rates for results that are simple to transfer to more routine applications. Ramp rates on this thermal cycler system are variable, and users can set parameters such as time, temperature, alarm ranges, auto restart dialing, and stores up to 700 user defined PCR programs. This Eppendorf Mastercycler Ep Gradient Thermal Cycler was tested by our service team multiple times to ensure system is working to factory specification. We used our temperature verification probes to validate this thermocycler and unit ramped up at 95°C and ramped down to 4°C without any issues. System is fully validated with clean bill of health. All of our lab equipment comes backed with our standard warranty. Should you have any questions, please don't hesitate to contact us.